I love breakfast. I mean, I adore it. I could eat breakfast at every meal if my body would tolerate it, and if there was ice cream on a waffle or something, I would seriously be in heaven. I have always leaned toward sweet foods, and breakfast is no exception. I have adored making pancakes since I was a kid. (Banana chocolate chip? Yes please!) As an adult, I’ve always had a fun mix or two on hand – buckwheat, gingerbread, pumpkin, etc. When I go out to eat, not surprisingly, I like to gravitate towards the sweet stuff. Favorites include gingerbread pancakes with ginger sauce, Belgian waffles with ice cream, stuffed French toast…you get the idea. I love an omelet or a fried egg, but those have always been my highlights. Over the last few years, I’ve made gradual changes in my go-to breakfasts to promote weight loss or maintence. For instance, I went from two slices of toast to one, and I limited the toppings. I went from sweetened yogurt to plain (regular or Greek) and went from less healthy cereals to Kashi or, more often, oatmeal. And I went from eggs (sometimes with veggies) and cheese to more often, just eggs (and veggies), making cheese an occasional treat rather than the norm. These changes seemed to help not only with weight loss but also with limiting the highs and lows of sugar. Less carbs made me feel fuller, much as I didn’t want to admit it. And I became less likely to throw chocolate into breakfast or coffee when I saw that it meant I was fuller longer. So before I committed, I brainstormed and researched fun breakfast recipes. It would take a brain and body reset, but I knew that with practice, I could embrace my new, not so sweet breakfasts. 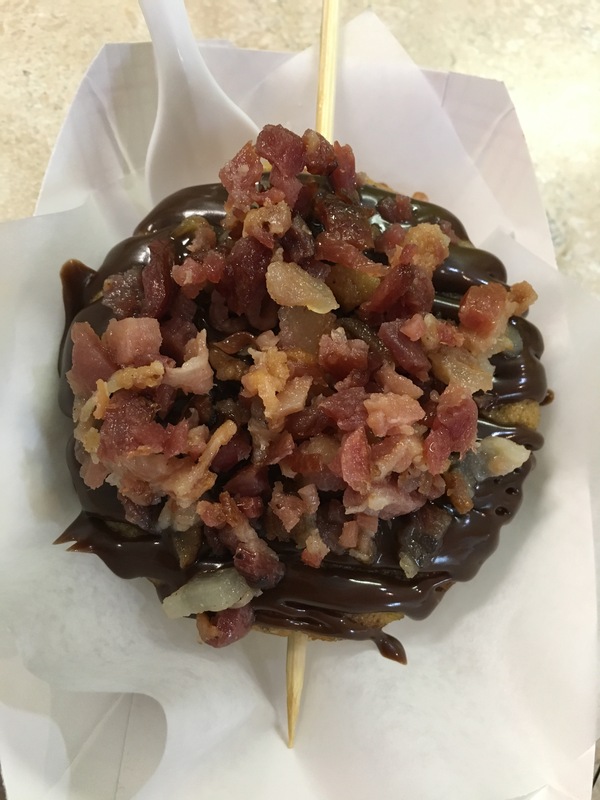 The sugar highs and lows of the American diet are crazy. Now I rarely miss caffeine (I can tolerate most tea, but I don’t have it often) and I stay full for 4-5 hours in between meals. Every day. 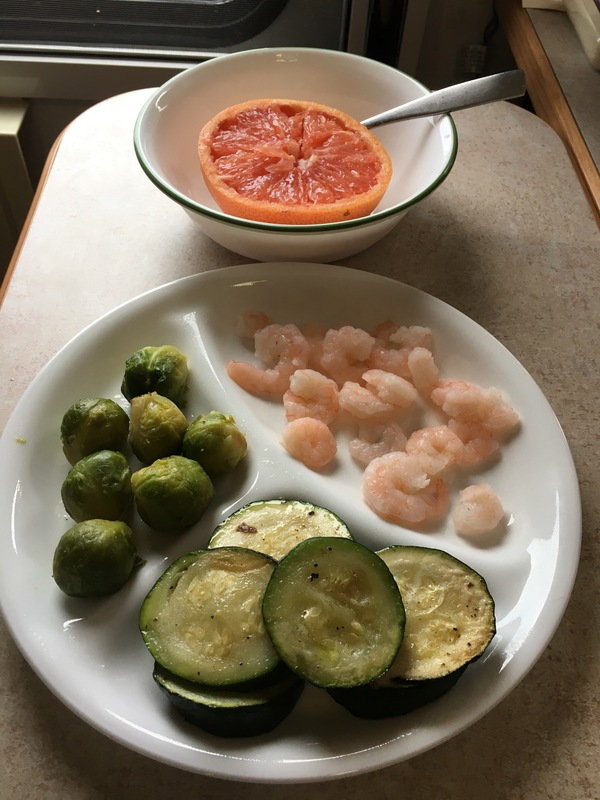 Here are a few of my current go-to breakfasts. I’d encourage you to try them, even if you don’t have any health reasons too. It’s very healthy food and your body will thank you – and they’re tasty too! For sauerkraut, I stick to fancy organic brands to make sure I’m getting some nice probiotics. I try to alternate brands or flavors each week. Kimchi will also be in the mix, although so far I’ve stuck to three or so brands of saurkraut. Someday I hope to make my own, but it takes a few weeks and I haven’t dared yet! For the veggie mushroom medley, I’m incorporating favorites but try to mix it up. I know greens are important for those with autoimmune issues, so that’s a staple. A container of frozen spinach is often the basis, but I’ve done fresh kale, frozen collards, Swiss chard and whatever else is around. I absolutely love mushrooms, so I will do shiitake or whatever is around, fresh or frozen and organic when I can afford it. I’ll season it all with turmeric, ginger, garlic or whatever I feel like. 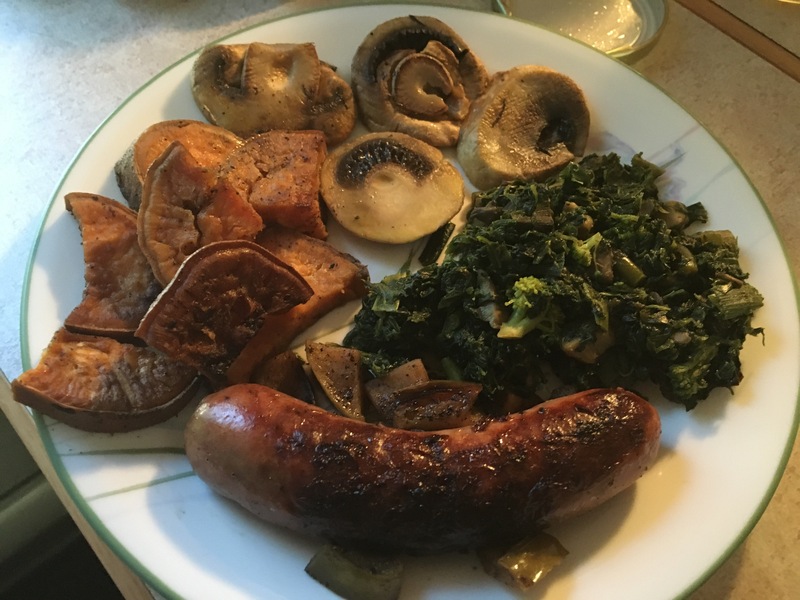 I cook the potatoes and veggies around medium in a skillet and experiment until I like where it’s at! I got fancy beef and made very fancy (small) burgers my first week on the diet to help me get excited about breakfast. 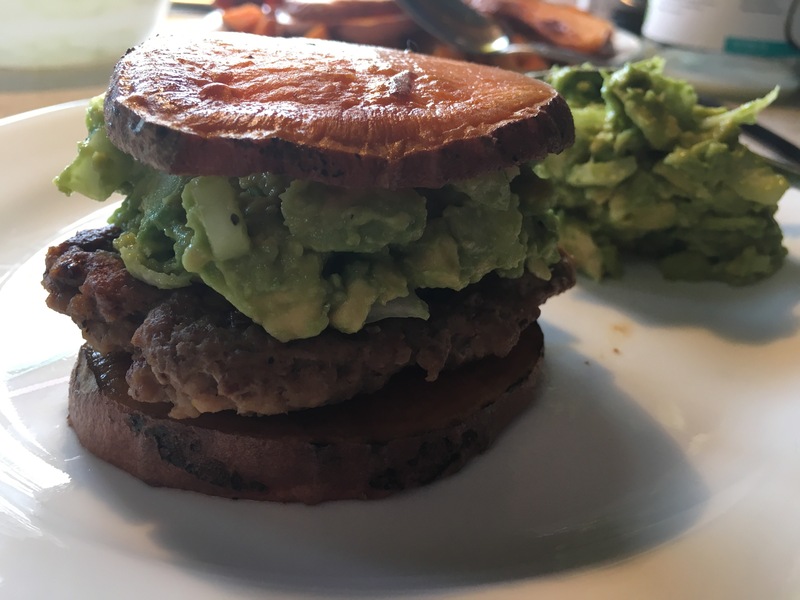 Some days I would top them with avocado, and I sliced up sweet potato slices to use as buns. Sauerkraut and veggies on the side of course. Burgers for breakfast seem indulgent and they’re delicious! For sweet potato buns, there are tons of recipes out there. I tend to just use a skillet on medium and cook them for 8-10 minutes per side (you want them to get roasted but not super soft) but you can bake them too, like this recipe suggests. 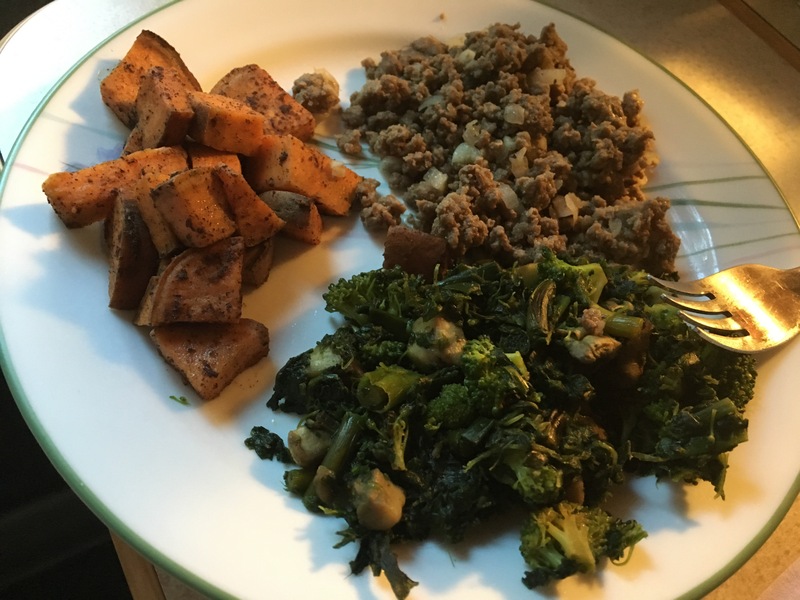 My other go-to breakfast has involved ground beef, sometimes just with onion/garlic/spices and other times mixed in with veggies and sweet potato. This week I tried a Moroccan-inspired skillet and I love it. There are tons of flavor possibilities. This has become my new once a week treat! It’s not the healthiest or the most filling breakfast out there, but it feels indulgent and delicious. I still pair it with some meat – either an Epic brand meat bar (check the ingredients first) if I am on the go, or some other meat option. Freeze-dried fruit – it’s expensive at my local food Co-op ($5.50-$8 for a few servings) but worth it to me. I love bananas and they’re a good cereal shape. 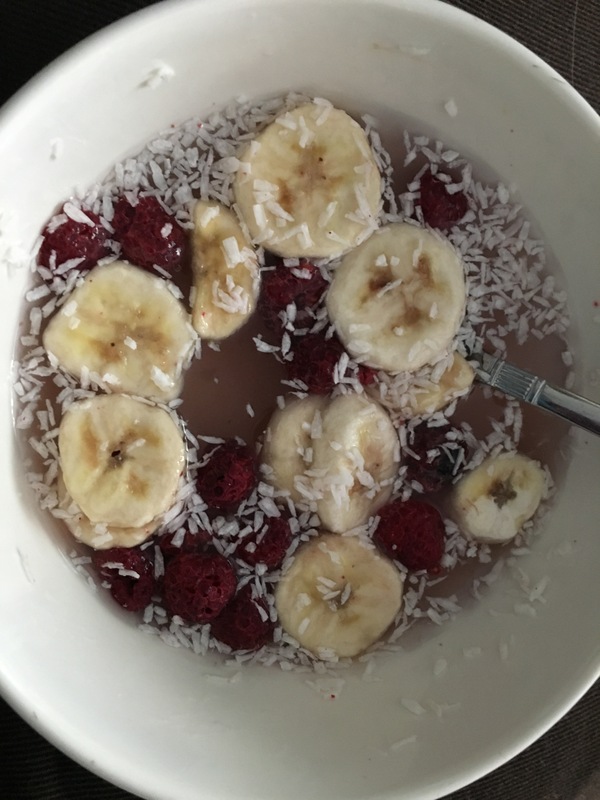 Last week I picked up raspberries, my favorite, to mix with the bananas. Shredded coconut – You’ll probably need a natural foods section for this. Pretty cheap at my go-to supermarket. Coconut water or coconut milk – Coconut water is much more thin a texture than milk would be in cereal, but it’s still delicious and it’s very healthy and easy to find on AIP. I had to order coconut milk through Amazon to avoid carageenan, and it’s full of fat and calories so I haven’t bothered trying it for this yet. (It would leave me with a partially opened carton…) But I do plan to and I’m sure it will be even more delicious! Directions: Mix a serving of fruit (or a little less, if you’re like me and want to stretch out the fruit) with 2 TB of shredded coconut and about a half serving of coconut water (not sure how much milk). Let it sit for 10 minutes or so to rehydrate. And then eat and enjoy! I usually eat this on Sunday and I eat breakfast later than usual, anticipating that this light breakfast won’t hold me for 4 hours. More like 3.5. What do you eat for breakfast? Have you considered tweaking your choices? Any awesome recipes to share with me? I think it’s important to give those of you who are interested as much background on me and my health as possible. If you’d rather skip ahead and read about tips you can act on, feel free to skip this one. Word of warning: this is a long one, and it gets very personal! I’ve always been a relatively healthy child. I loved the outdoors and dancing – and at five, I aspired to be a singing basketball player! I was typically in the 70% percentile for weight and the 30% percentile for height, but I was healthy – no doctor ever wanted me to lose weight and I always felt comfortable with my body – at least when I wasn’t in dance classes with tiny girls younger than me. I did suffer from lots of environmental allergies, and I had sensitive skin (undiagnosed keratosis pilaris, rosacea and Raynaud’s Syndrome occasionally made themselves known in appearance only) but was considered very healthy. I began piano lessons and typing in fourth grade, and by high school, I was studying the Alexander Method and yoga in bits and spurts that helped to connect me to my body and my surroundings. I was diagnosed with mild scoliosis at thirteen, but upper body exercises helped to keep my shoulders straight and keep things from becoming painful. I was a softball player through my freshman year of high school, and I played a variety of other sports too, although I was most definitely not an athlete and would have preferred to stick to dance, theater and maybe softball if my theater schedule didn’t conflict. I remained active in college. I did gain the freshman ten or fifteen, but I was able to lose most of it fairly quickly (desserts at lunch and dinner and bread had been my downfall) and I continued to dance and exercise at least a couple of times a week. I accelerated during my second year in school, and soon after doing so I was diagnosed with mono for the first time. Otherwise I was fairly healthy in college, at most maybe ten pounds overweight, and I was able to graduate in three years which saved me a lot of money. It wasn’t until after college, when I returned from my first summer of summer stock – where I was often playing the piano for more than twelve hours per day – that I began to struggle with pain along the lines of carpal tunnel in my arms and wrists. I saw a chiropractor for the first time who also practiced natural medicine. She helped get things realigned but scared me when she prescribed me vitamins that made me break out all over, so my visits there were short-lived. After that, I found that as long as I kept doing upper body exercises, I felt pretty good, and if I didn’t overdue it, my carpal tunnel symptoms stayed away too. In 2010, I started a theater company. This new project was incredibly fulfilling, but over the next four years, it took over my life. It also added a lot of stress – sometimes an insane amount – into my already extremely busy schedule. By 2013, which was the most stressful year for me as Artistic Director, I began exhibiting new symptoms. On a visit to the dentist, I was informed that I was suffering from extreme dry mouth. We talked about how medications (like my allergy medications) could be contributing to it, and I was told to use a different toothpaste to combat it. I believe Sjogren’s syndrome might have been discussed as well. When I had my annual eye appointment, we had a conversation about ways to self-massage my eyes to combat my dry eyes – ultimately we resorted to medication, and I now take Restasis to combat this. And in conversations with an allergist, dermatologist and my gynecologist, my dry skin issues were discussed and I was diagnosed with keratosis pilaris and rosacea for the first time. I also unexplicably began dealing with herpes symptoms – we still haven’t figured out how I acquired that, or if it was related to mono! So that added a new medication to the mix as I started taking Valtrex. And I began battling frequent yeast infections that resisted treatment – I was told to cut out sugar when that happened, which did seem to help, but infection would always reoccur soon enough. In retrospect, it’s very obvious to me that the stress of the theater company was having a very detrimental effect on my health. In practice, everything I was dealing with just seemed like a minor annoyance. I never thought to put it all together, and neither did my doctors, so we continued to just treat the symptoms even though I heard over and over again that “they’d never seen this in someone as young as me”. By 2014, I switched to a new doctor – finally I had a doctor who was observing and listening and not just taking my money! After I took on a full-time desk job for the first time, she quickly diagnosed me with carpal tunnel, and while I was there, she asked if I had Raynaud’s Syndrome. After I did some research and found out it ran in my dad’s side of the family, I accepted that I had that too! My fingers and limbs had always changed colors in ways my friends’ didn’t, but around 2014, I began having issues with both my hands and feet losing circulation. Once we put a name to it, I began stocking up on fingerless gloves and planning accordingly – I’m much better at managing it now. It was also around this time that I began to recognize that although I had scaled back my theater projects and responsibilities (and although my wedding had passed), I was too tired. Chronic fatigue was making me want to be in bed by 9 p.m. And by 2015, it had gotten worse – it was hard for me to stay awake after 8 p.m. many nights! This was so different from the me who had gone to theater rehearsals 4-5 nights a week that I knew something was wrong. So in June of 2015, I returned to the doctor complaining of chronic fatigue and wanting to find a solution. We began testing for everything under the sun. Because I’ve always been someone who slept really well, we ignored the sleep study option because it seemed much more likely that something else was going on. When I returned to the doctor’s office to go over my results (all negative besides a very minor Vitamin D deficiency), my doctor was on vacation, so I saw a nurse practitioner. She told me to stop taking Valtrax and she ordered a bunch of additional tests. One week later, I returned to go over the results – this time with my doctor. Since stopping Valtrax, my symptoms had gone through the roof. Instead of just dealing with fatigue, I had dehabilitating fatigue, making it impossible for me to focus or work for more than a couple of hours a day productively. My doctor mentioned that she’d test me for mono again since everything else was negative – and based on the results we got back, I was told I had mono. Again. Only later did I learn that chronic mono is an unusual thing – I shouldn’t have gotten mono a second time, and if I did, it was due to extreme stress and/or a compromised immune system. Also, the fact that my symptoms worsened after I stopped Valtrex pointed to another possibility, according to what I read online – Valtrax is used to treat chronic mono (off-label) successfully for many, so perhaps I’d actually been fighting it, perhaps since 2013, and thanks to Valtrax I hadn’t had to really deal with the symptoms until now? My mono, or whatever it actually was – my gynecologist didn’t believe it, and my new rheumatologist has pointed out that although the markers showed I was fighting a disease, they couldn’t have proven it was an active mono infection as opposed to an active something else – lasted about four months. The second half was much more manageable, thankfully, and my boss allowed me to work 4 days a week instead of five so allow me to rest mid-week, which helped. When my chronic fatigue continued, my doctor referred me to a rheumatologist for the first time. Almost three months later, in January, I had my first appointment. My rheumatology appointments were odd, to say the least. Although she asked lots of questions, she would abruptly leave without telling me what we’d do for next steps. After my first appointment, I had knee xrays done (they’d given me major issues during a Disney trip) and she tested for a variety of conditions. The only thing I was positive for was an extreme Vitamin D deficiency, which we treated successfully. She tried treating me for dryness, but all the medicine did was give me nausea and possibly some fun rashes, so I stopped the meds. When I called to follow up, I was told she didn’t want to see me again unless my symptoms changed. So much for that…. Soon after I began working with the rheumatologist, I decided I’d start exercising every day. I was already eating healthy food 90% of the time (mostly vegetarian, lots of fresh produce, etc.) but I knew I could stand to lose a few pounds – and more importantly, everything I’d read had pointed to the importance of moderate exercise in managing auto-immune issues. I told myself even 5 minutes counted…and I stuck with it for more than 90 days in a row! Exercise definitely makes me less tired, and I lost my extra pounds too. I also requested a visit with a nutritionist. 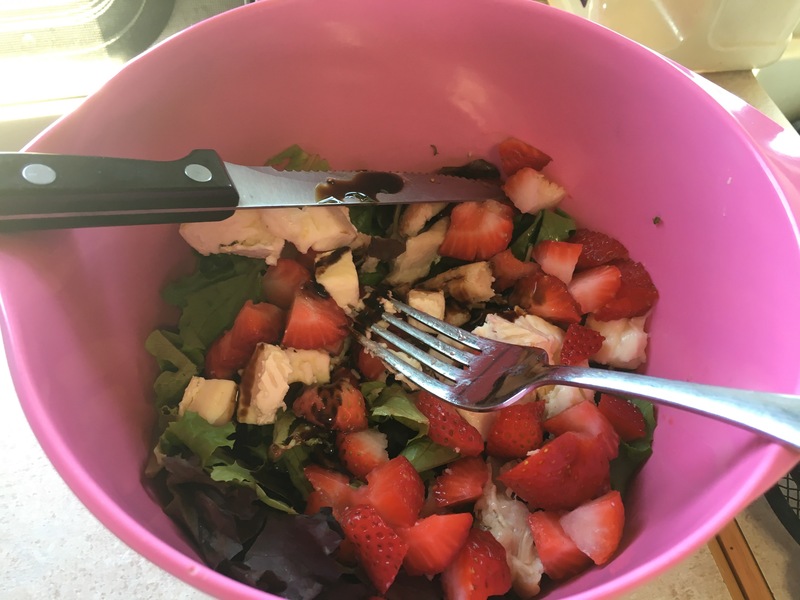 She wasn’t interested in doing anything but an anti-inflammatory diet until we had a firm diagnosis for my fatigue, so unfortunately I decided I’d have to go it on my own in that department, although I did discuss things with my primary care physician. I generally followed the anti-inflammatory diet for lack of a better plan, but I kept reading and researching, feeling like I’d need to do more and consider an elimination diet if I wanted to see real change. Although I’d never been diagnosed with food allergies, I had a feeling that I might have a gluten sensitivity – I’d had major digestive issues during mono, or “mono” in the fall, and gluten seemed like it might be a trigger. And I knew that I might have issues with dairy too – it did seem to contribute to nasal congestion, if nothing else. In researching on the vast and wild world of the internet, I learned about the AIP – the auto immune protocol. I am still only a beginner at understanding what this is, but it’s basically a series of guidelines for those with auto-immune diseases and symptoms. To follow the protocol, one begins by eliminating any foods, drinks or spices that can cause gut irritation for those with auto-immune symptoms. After a period of allowing the body to heal, one begins reintroducing foods – and for some people, they’re able to return to a “normal” diet, but many find that they need to stick to some version of the AIP forever. It’s a challenge, but the benefits that people cite from this diet are amazing. Many report eliminating or greatly reducing their symptoms – even people who have been severely dehabilitated! So as much as I have always felt like I do best using moderation, not elimination, in my diet, I had to give myself the chance to try this. After all, even if I can’t get a correct diagnosis, if my symptoms go away, I wouldn’t have anything left to resolve with my health! I read the Whole 30 book in hope to gain some scientific understanding of why diets like this are helpful (and not crazy talk). It definitely confirmed for me the importance of a diet like this. It would give my body a chance for a reset, and hopefully it would make it so that everything from my allergies to my arms would be better for it. So on July 18th, I began following the Whole 30 Auto-Immune Protocol. I will talk more about what this means in future posts, but the list of what I cannot eat on it is extreme. No sugar or anything like sugar (including maple and honey), no dairy, corn, soy, nuts, legumes, grains or anything that resembles grains, no nightshade vegetables (tomatoes, eggplant, potatoes, peppers, etc.) and any spices from nuts or seeds. 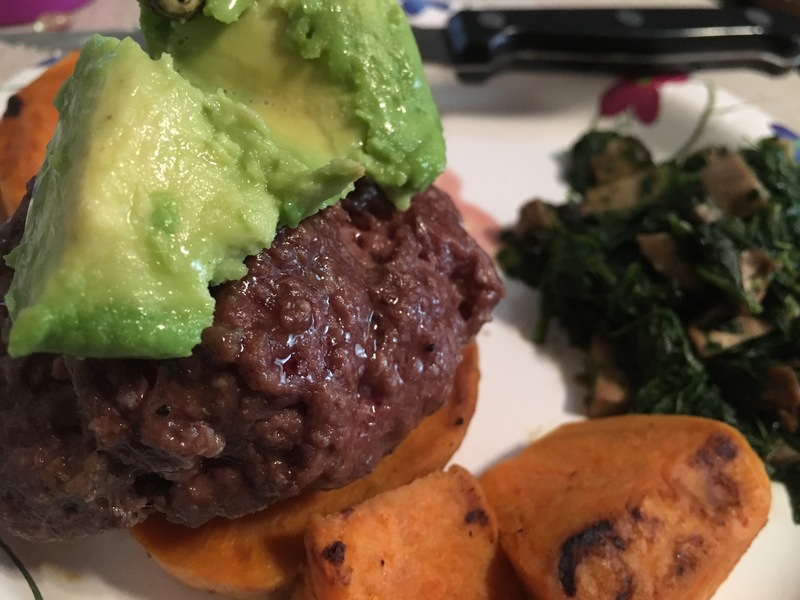 As a result, I am cooking my meals daily – eating out is almost impossible – and getting more creative with the food I can eat. I’m already seeing mild improvements in my dry mouth, nasal congestion and fatigue, so I’m optimistic that this can really be effective for me. So that’s where I’m at. At this point, my new rheumatologist is out of easy tests. Rheumatoid arthritis was the final negative we got. So for next steps, I can either do some serious tests looking for carpal tunnel or Sjogren’s, or we can try treatment and see if it works. So before I take a next step, I’m going to see how I do with my own self-care, focusing on diet as well as exercise, meditation and stress management. Future blog posts will be focused on a specific topic, generally speaking, and will be MUCH shorter. But thank you for reading and I hope you’ll come back soon! And please tell me about yourself. I look forward to hearing about your own health challenges and how you’re working to handle them – and what you’d like to read about in the future!